With class-leading noise rejection "twice that of most comparable instruments" and enhanced software filtering with four user-selectable options, Megger's new S1 series 5 kV and 10 kV DC insulation resistance testers deliver dependable results in even the most severe electrical environments, including extra high-voltage substations. Not only has the performance of these ground-breaking instruments been exhaustively proven in the laboratory, it has also been convincingly demonstrated in the field. Accurate and consistent results were, for example, obtained in a working 765 kV substation where no other DC insulation tester had been able to operate successfully. 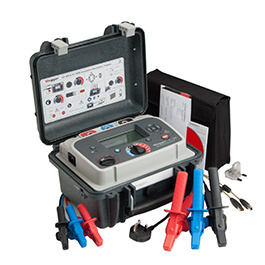 Megger S1-series insulation testers are available in two models. The S1-568 tests at up to 5 kV and can measure insulation resistance up to 15 TΩ, while the S1-1068 operates at up to 10 kV and measures to 35 TΩ. Both models have a high short-circuit current of 6 mA to ensure rapid charging of items under test and both have a CAT IV 600 V safety rating at altitudes up to 3,000 m.
Other innovative features include provision for remote control via a fully isolated USB port, which makes the instruments ideally suited for use in production environments, and internal storage for date- and time-stamped results. Stored results can be recalled to the display, downloaded via a Bluetooth wireless link or accessed via the USB port. To ensure that testing is never delayed through lack of power, S1 insulation testers incorporate rapid-charge Li-ion batteries that give up to 6 hours of continuous testing on a full charge for the 5 kV model and 4.5 hours for the 10 kV model. It takes just 2 hours to fully charge the battery and even on a 30 minute top up charge you can get in excess of an hour of continuous testing, or alternatively the instrument will operate from an AC supply even if the battery is completely flat. Compact and light, the S1 insulation resistance testers feature a tough dual-case design and, with the lid closed, they have an IP65 weatherproof protection rating to safeguard against dust and moisture ingress. They offer timed insulation resistance (IR), dielectric absorption ratio (DAR), polarisation index (PI), dielectric discharge (DD), step voltage (SV) and ramp diagnostic test modes, and also have a dedicated AC and DC voltmeter function.